Although the use of evaporative/adiabatic cooling in data centers is growing by leaps and bounds we face an interesting problem here at Aztec and Alton. As part of a larger half-billion dollar corporation you would think that engineers and contractors would not be hesitant to use our products. However, over the years our company has kept a low profile and that philosophy seems to be coming back to bite us. The list of companies that are already using evaporative/adiabatic cooling includes some of the biggest names in the mission critical world....Facebook, Yahoo, Microsoft, Digital Realty Trust, Sabey, Google, Apple, Amazon, Skanska, CyrusOne, and Dell...all use evaporative/adiabatic cooling in many of their centers. Most of the time they are using either one-of-a-kind custom units from small specialty manufacturers with small support organizations, or, products from companies such as Munters. In the class of equipment from larger evaporative cooling manufacturers Munters is probably the most widely known brand. Most engineers, contractors, and mission critical decision makers are willing to accept the Munters name as a sign of quality due to their long history in the evaporative cooling world. Munters started in 1955 in Sweden and has built a nice business that finally expanded to the US in the mid-1980s. There is a company that pre-dates Munters by almost 10 years and has been in the US market for over 60 years...and that company is Alton and our indirect evaporative cooling brand Aztec. Many of the techiques used by Munters and others in the evaporative cooling industry were either used or patented by Alton and Aztec long before these other companies even existed. 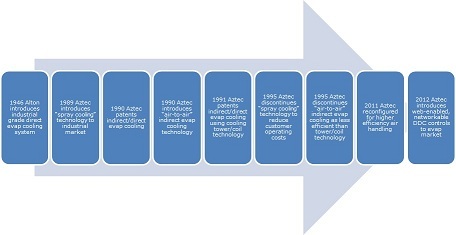 Many of those techniques were abandoned by Alton and Aztec because our experience in the field of evaporative cooling showed us that those techniques were either less effective or too costly to maintain for the user. So when it comes to credibility and trust in this segment of the industry it seems there is another option that users should consider...Alton and Aztec.